Kid President is cool. He is now looking for awesome girls to celebrate. His video is endearing (and funny) but rings true. Girls often don’t think they’re awesome. I felt invisible and unwanted by my peers until I lost weight and started winning beauty pageants — at least in my small town. Being smart was not a good thing. Being pretty was. I remember feeling very un-awesome. We MUST tell girls they are awesome just like they are! We can complain about “the media.” But now we have a cute kid (and his brother) who want to celebrate awesome girls. We should be all over this one! Pile on! So, if you want to help girls or are working with girls, why not join Kid President in celebrating these awesome girls! Why not take pics of your classroom of girls and tweet to #kpawesomegirls? Why not celebrate some awesome girls in your life? Why not share some awesome inspiring girls of history? Who knows some awesome girls??? Let’s have fun with this! So, Kid President is doing this, he’s cool. Much cooler than you and me saying it. (Sorry teacher friends, that is how it is.) Girls (and boys) need to know they are awesome. Each child is a masterpiece. Every child matters. With all the messages girls get in magazines and media, we need to help them see their own beauty. This is a trend we can join. So, I’m going to start by tweeting out that my friend Angela Maiers is a #kpawesomegirls (that is with an “s”) because of her #choose2matter movement. Kids matter. I’ll use any means necessary to help them know that. How about you? Who are the awesome girls in your life? 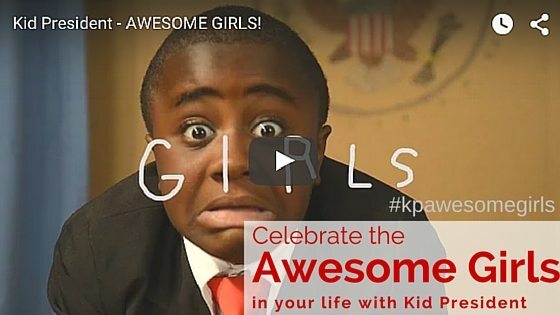 The post Celebrate Awesome Girls with Kid President! #kpawesomegirls appeared first on Cool Cat Teacher Blog.